Hello hello! Welcome to the last week of September! This week we’re welcoming a great number of good books and I can’t wait to share them with you. I don’t have any time to add the rest of my news for today, but I’ll have it up soon (probably tomorrow if I get the chance to write). Wow, hello there! I must apologize for being MIA yesterday. I unfortunately don’t have a prepared review for you either. I will have one next week though! I had my first two tests (statistics and philosophy). They both went pretty well, and I’ve got a psych test tomorrow. We had a football game Friday and an invitational yesterday. It was the first time we performed the whole show, and it was an improvement from Friday to Saturday. There are things we need to fix, but I know that we’ll be able to get them. There’s a lot of buzz going around about Homecoming and the dance. It’s coming up a week from Monday (the whole week, not the dance). I’ve got my dress, and it’s gorgeous. I love it so much. I feel like a bit of a warrior in it if that makes any sense. I will share photos with you when I have some of the dance! My boyfriend and I are going together, and I’m really excited. It’s my first homecoming with a date – the last three years I went without one – and we’re going with a bunch of band kids so it’ll be really fun. I may be a little off and on these coming weeks – band is really getting into full swing, and it’s hard to keep up with the blog and school. I will pop in as much as I can and I’ll still be active on Bookstagram. Thank you for your patience! I have a pretty busy day. First I have work then orchestra and then I have a college fair thing for Harvard, Stanford, Duke, and Georgetown. It’ll be interesting, and I hope it goes well! Hi everyone! Today I’m going to be discussing one of my favourite novels of all time, Jane Eyre. Some of my absolute favourite movies are adaptations of books, and I love discussing my opinions. Mostly, the book holds a special place in my heart…but there have been times when I’ve actually liked the movie more! There’s no doubt about it – the acting is top notch and the love between Jane Eyre and Mr Rochester rings pure and true in this movie. It’s beautiful, lovely and made me cry just as the book did. The included all the important scenes, and made them truly amazing. But…I didn’t enjoy it quite as much as I remember liking the 1997 version. Hello there! I wanted to celebrate the release of this lovely book with a review. 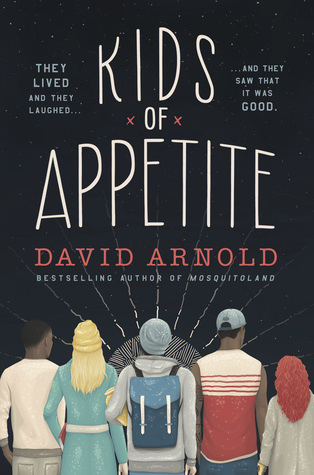 David Arnold is a lovely author, and his debut novel Mosquitoland (review) completely took me in. I recommend it to practically everyone I come across. It is one of my all-time favorite books, and I’m so excited that he’s releasing more books. What a unique story. I wouldn’t say this book is too realistic in it’s plot per se, but it definitely conveys many things that are relatable. I love David Arnold. He is hands down one of my favorite authors, and I am seriously so excited to see where he goes with his writing. The main story focuses on Bruno Victor Benucci III who is known as Vic. Vic has a hard time physically expressing himself because he has Moebius syndrome. This disease inhibits one’s body in forms of paralysis, and for Vic it’s his face. He has to thoroughly think through what he is feeling and verbally convey it if he wants others to know how he is feeling. This poses an interesting theme of communication throughout the book, and how people are able to connect with each other. I love the idea of fulfilling someone’s dying wish. I think it’s something that I would want someone to do for me, and I’m glad Vic does this for his dad. It’s a way for both the person who has passed away and the living to have some sort of closure. His adventure in completing his father’s list is something I loved. The cast of characters in this story is amazing. Coco is one of my motherfrakking favorites. She is spunky and isn’t afraid to be direct with people. She has learned how to listen to people in a way that makes them at ease. Though she may be (very) nosy, she means well and I love how protective she is of Mad, Baz, and Zuz. Her obsession with frozen dairy products makes my life. I love them just as much as she does, and I appreciate it. Frak yeah. The story’s format is different, and after reading the first chapter or two I really started to understand it. I like how it contributes to the story as a whole. I also love how the interviews preface what’s to come later in the chapter. I think it’s clever the way Arnold wrote this story. Overall I gave this book 5/5 stars on Goodreads. I don’t love it as much as Mosquitoland but I did enjoy reading this book. I hope this helped! Hi, book dragons! Here we are in our second full week of September welcoming in so many new, amazing releases! I hope this month is going well for you. Alas, I have fallen behind quite a lot in my reading goals and pace. ANYWHO – onto the news! 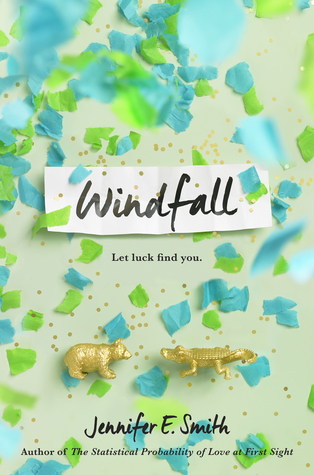 Best-selling author Jennifer E. Smith is publishing Windfall in May of 2017. The official date is said to be May 2. Entertainment Weekly helped the author make this announcement with a cover reveal as well as an excerpt. Click here to read the article. Synopsis: Alice doesn’t believe in luck—at least, not the good kind. But she does believe in love, and for some time now, she’s been pining for her best friend, Teddy. On his eighteenth birthday—just when it seems they might be on the brink of something—she buys him a lottery ticket on a lark. To their astonishment, he wins $140 million, and in an instant, everything changes. Director Ava DuVernay made the announcement earlier this week on Twitter of these new cast members. DuVernay also directed Selma among other films. Greg Berlanti will be directing the Simon vs. the Homo Sapiens movie. The novel by Becky Albertalli was published in 2015 and made quite the splash. Berlanti’s other works include Arrow, The Flash, and Supergirl. Read the full article on Entertainment Weekly here. Sarah J. Maas’s bestselling Throne of Glass series is set to be turned into a tv series on Hulu. The producer is Mark Gordon Company and is going to be directed by Anna Foerster. Read the full article here. See anything you love? I hope you had fun reading this! Hi there! I finished out the three companion novels by Stephanie Perkins, and I was a bit disappointed with this one. More to come on that though. It was a cute book, and all three of them together make a great aesthetic. I have to say that I liked this least of the three Stephanie Perkins novels. It wasn’t as developed as the others, and I wish I had gotten to know Isla more beyond her obsession with Josh. One question that is asked is if you have to read them in order. You may prefer to because they build off each other and there are cameos of old characters in the new books. If you’re curious to know what I thought about Anna and Lola just click their names and it’ll take you to those reviews. Isla was underdeveloped. I feel like she had so much potential, especially after Anna and Lola. She only thought about Josh and how he affected her and vice versa. It felt like her life revolved around this guy she’d had a crush on for a while. Though this isn’t awful I felt like she needed a hobby or passion. Anna had film, Lola had fashion, and Isla… had Josh. I know part of her story is that she doesn’t have a passion. She doesn’t know what she wants to do with her life, but I feel like she could have had so much more than just be in love with a boy. One of my favorite characters was Kurt. He is straightforward and no-nonsense. I appreciate the little details Perkins includes in her writing. Lola had 2 dads. Kurt has high-functioning Asperger’s syndrome. They are never the thing in her plots but they add depth and texture too them that isn’t in your typical contemporary. 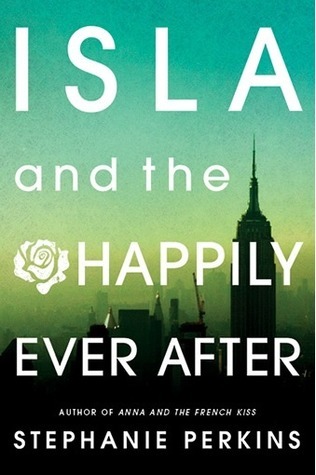 Despite my qualms about Isla (and her poor decision making) this was a pretty okay book. It was nice to hear about the other characters and how they’re doing, especially Anna and Etienne. It’s a cute contemporary read if you’re looking for one. Hello, there! I didn’t write yesterday, but Maiya did instead! I hope you enjoyed hearing from her! She and I have been quite busy since school has started. It was the first full week of school. I am finally starting to get into my rut, but there are still a few things I have to work out. I’m sure it’ll be fine in the coming weeks. I started up doing my reading for my fem lit independent study, and I’m loving it. It’s the best course I’ve taken in school, and I can’t believe it’s only one semester! I’m also taking a philosophy course and that is just a whole cup of tea. I have to start reading more for that class too. So much reading. That being said, I haven’t gotten much personal reading done. I’m still making my way through The Unexpected Everything and I’m loving what I’ve read so far. I’m going to my niece’s first soccer game! It’ll be fun and cute because they’re just starting out. I also work the for part of the day, so that’ll be fun. Making money is always productive. I also need to do the crap ton of homework I got because I don’t want to do it tomorrow. I’m actually going dress shopping tomorrow! it’s the first time I’ve been, ever, so I’m kind of excited. I don’t know if I’ll find anything, but it’ll be fun to go. We have our second home game and our home invitational this weekend. It’ll be quite busy, but I’m sure I’ll make it through it all. I hope you all have a great week! If you have any questions for either Maiya or I please comment them below!